The lyrics are good. The melodies are decent. The problem is, the two can't manage to work together long enough to result in something compelling. In hindsight, it seems pretty obvious that Gravity was Our Lady Peace's way of making a plea for mainstream American acceptance. They hired the big name producer (Bob Rock, most famous for Metallica's various transformations over the last 15 years), they made a big radio push, they had a hit single (the ubiquitous-for-a-minute "Somewhere Out There"), and they sold their album at a bargain price for the first week. And it worked! The result was the Canadian superstars' first visit to the top 10 of the American album charts, even amidst middling reviews and the typical predictable cries of "sell out!" from the diehards. Really, emphasis on radio and sales figures aside, Gravity was a pretty solid album with a couple of beautiful standout tracks that just happened to turn into singles. Healthy in Paranoid Times, then, would be the return to "art", or so the band would have you believe. Some of the tracks even back up such a claim -- the slow-burning sneer of "Wipe that Smile Off Your Face" resonates long after it finishes, its confrontational tone startling amidst Raine Maida's usual palette of celestial metaphor and impenetrable symbolism. In fact, "Wipe that Smile Off Your Face" is symbolic of a developing trend in Maida's work, likely a direct result of his recent experience facing the horrors of war's effect on civilians via the War Child organization. "The time has come/ To drop the bomb/ On the pain you've been selling," he says, and it's obvious he's fed up with the political machine and its justification for war, inspired no doubt by pain too-often ignored by media outlets in favor of the latest batch of rhetoric. His inspiration is worthy, and for at least one song, we can feel the pain he's just barely holding in, ready to explode at any second. 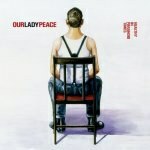 Still, it seems that Bob Rock can't help himself from turning Our Lady Peace into as much of a pop band as it can be. With lyrics that touch on sorrow and calls to arms, the unabashedly mainstream sound of so much of the music on Healthy in Paranoid Times is incongruous and disconcerting. These thought provoking lyrics are stuck on top of music that's more interested in making heads nod than pointing its listeners in the direction of the words. "And I'm not sure what the hell we're fighting for/ And does the money make us?/ And will the future blame us?," Maida wonders in "Will the Future Blame Us," but the continuation of those insecurities in the chorus is overshadowed by long, drawn out syllables that inexplicably concentrate on a new vocal tic that will hereby be known as "throaty frog voice". "Sometimes you wanna scream out/ And sometimes you just can't/ Cause your lips feel like they're glued together/ And no one gives a damn," says Maida, over a beat that recalls something along the lines of "Just a Gigolo" as played by Tears for Fears. Granted, the song eventually does some proper rocking, and the overlying theme of the song is finding a light amongst the darkness, but it still seems an awful lot more peppy than it probably should. Another surprising development is just how derivative parts of Healthy in Paranoid Times seems, something made most obvious by the U2-aping of "Boy". The structure is typical of a U2 slow-burn (think "Walk On"), there are some appropriately Edge-ish guitars in the mix, and Maida's insistence on beginning every line of the verse with "It's time for..." is eerily reminiscent of Bono's "Is there a time for..." in the verse of 1995's "Miss Sarajevo". Almost as painful is the oddly Blink 182-ish "Where Are You," which employs a choir in its big climactic bridge -- a trick that I'm starting to suspect is a once-an-album contractual obligation. Once you get past how uncomfortable the juxtaposition of seriously heavy lyricism with upbeat, often bouncy melodies makes you, however, there's a decent chance you'll enjoy the album. For all of its awkward leanings, the melodies are catchy, and the beats are crisp and tight, popping out of the speakers and driving everything forward with authority. Rock even shows hints of subtlety in his use of distant backing vocals on the pretty excellent opener that is "Angels/Losing/Sleep", and the last gasp/total tease that closer "Al Genina (Leave the Light On)" presents is a case study in leaving the listener wanting more. The liner notes of Healthy in Paranoid Times are presented as a series of statistics meant to make us think a little harder about the world around us, framed by the fact that it took 1,165 days to record the album itself (example: in those 1,165 days, 300,000 civilians died in Darfur). The problem is that among those stats is the fact that 43 songs were written and recorded in the process of creating the album. It's tough, even among so many other more serious and grave numbers, not to dwell on that one and wonder: all that, and this is the best they could come up with?